Now that you’ve made the decision to install high quality shutters in your home, it’s time to select the best possible option for you. With so many styles, materials and configurations to choose from, this can be a bit overwhelming. This is why we make sure that our shutter specialists are available to assist our customers throughout the process of designing and placing the shutters for their homes. Simply stop by our showroom to meet with one of our friendly representatives for assistance in selecting each element of your new shutters. Here, they will help you choose the right materials and shapes for your unique space. One of the most important steps to take before your appointment is to determine your goal aesthetic and shutter style. To help you do this, we’ve provided the list of shutter styles below. This will help you determine a look for your shutters that will match the feel of your existing or desired home decor. Classic: Shutters are a beautiful complement to a classic decor. This is because their timeless beauty and look of luxury are able to make a statement without overpowering other statement pieces already placed in the room. 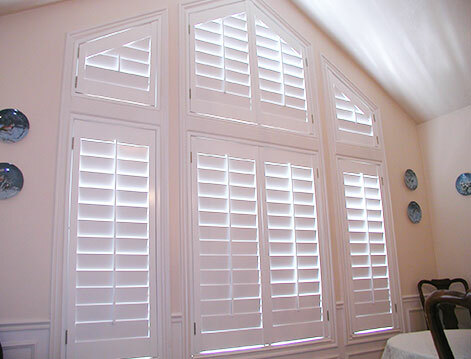 Wood shutters are most popular for classic decor, however, white and cream vinyls also look great in these settings. Rustic: Rustic decor almost demands the use of shutters for window treatments. This is because shutters can easily become a main focus in a rustic room while also complementing other design elements. Woods with knots such as the Knoty Adler are great for use on shutters in rooms with rustic decor. They add the rustic character and feel while also maintaining the look of quality and charm. Modern: While shutters are most commonly thought of for rooms with classic or rustic decor, they are actually great for rooms with modern decor as well. This is because their unique, custom structures allow more flexibility in design and configuration. Interesting angles and shapes can be created with shutters whereas blinds are less capable of fitting into different window shapes. Popular shutter materials for use in rooms with modern decor include vinyl and HDF as they are more easily colored and customized. We hope that you’re as excited as we are to begin the design process on your new shutters! Carefully consider each of these style options to determine the desired aesthetic for your shutters. Once you’ve got it, give us a call or stop by our showroom to get started!